Exhibition graphic designed by Steve Quinn, Associate Professor, Visual Communication, NIU School of Art and Design. The NIU Art Museum opens the biennial School of Art and Design Faculty Exhibition on Thursday, Nov. 16, with a public reception from 5 – 7 p.m. Presented every two years, this invitational show features recent artwork and scholarship by current faculty and teaching staff from all divisions of the NIU School of Art and Design and highlights the artistry, research and instruction found at NIU. The exhibition runs through Saturday, Dec. 16, and reopens Tuesday, Jan. 16 through Friday, Feb. 23, 2018. Faculty and teaching staff were invited to participate by submitting recent work in their respective artistic mediums or fields of scholarship. Work and research of over thirty individuals are represented and includes the disciplines of Art and Design Education; Art History; Ceramics; Drawing; Fibers; Illustration; Metals and Jewelry; Painting; Photography; Printmaking; Visual Communications; Sculpture; and Time Arts. The work on display represents the activity and interests of these individual members of the School of Art and Design, but also the breadth of the arts programs and disciplines offered at NIU. The gallery exhibition and accompanying public talks and lectures allow visitors and students to see these talented individuals outside of the traditional classroom or studio setting. A series of public events and lectures that accompany the exhibition will start in January. 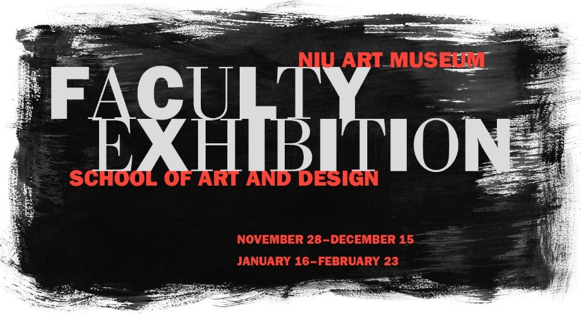 Participating NIU School of Art and Design faculty and teaching staff include: Michael Barnes; Wes Beeler; Sinclair Bell; Justin Bitner; Todd Buck; Sarah Evans; Billie Giese; Ola Giza; Cynthia Hellyer-Heinz; Rebecca Houze; Joseph Insley; Katie Kahn; James Kearns; Yih-Wen Kuo; Jessica Labatte; Christine LoFaso; Kimberly Martens; Jamie Obermeier; Mary Quinlan; Steve Quinn; Michael Rea; Nina Rizzo; Kurt Schultz; John Siblik; Richard Siegesmund; Geoffrey Todd Smith; Perrin Christian Stamatis; Ben Stone; Johnathon Strube; Frank Trankina; Peter Van Ael; Shei-Chau Wang; and Bart Woodstrup. A full calendar of events will be posted online and found by visiting www.niu.edu/artmuseum/events. Special note: The Art Museum galleries are closed Thanksgiving weekend, Wednesday, Nov. 22 through Sunday, Nov. 26. The show reopens after the winter break on Tuesday, Jan. 16 through Friday, Feb. 23, 2018.